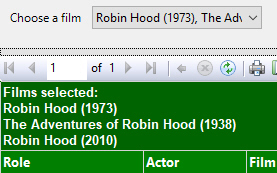 Create a report called Bo Selecta, add a data source which connects to the Movies database and a dataset which returns films whose title contains robin hood. Here's one way to achieve this. Add a calculated field called TitleAndYear which concatenates the film's title with the year in which it was made. Use the dataset to create a parameter called FilmID which stores the FilmID and displays the TitleAndYear. Check that you see something like this when you run the report. You'll need the Actor, Film and Role tables to select these fields. Add a filter to this dataset so that it returns only roles from the film you select in the parameter. The first couple of results for the best option in the drop down list. The first few results when you select the inferior Robin Hood films. The table header could look like this.